Filled to the brim with culture, cuisine and history the list of things to do in Krakow is robust, and sure to excite any traveler. Krakow, the second largest city in Poland, isn’t exactly a top bucket list destination for many travelers. Despite having over 10 million visitors a year only a small fraction of those visitors are from outside of Poland. That’s quite sad considering Krakow is a fantastic city, and an excellent destination for anyone looking to visit Europe on a budget. 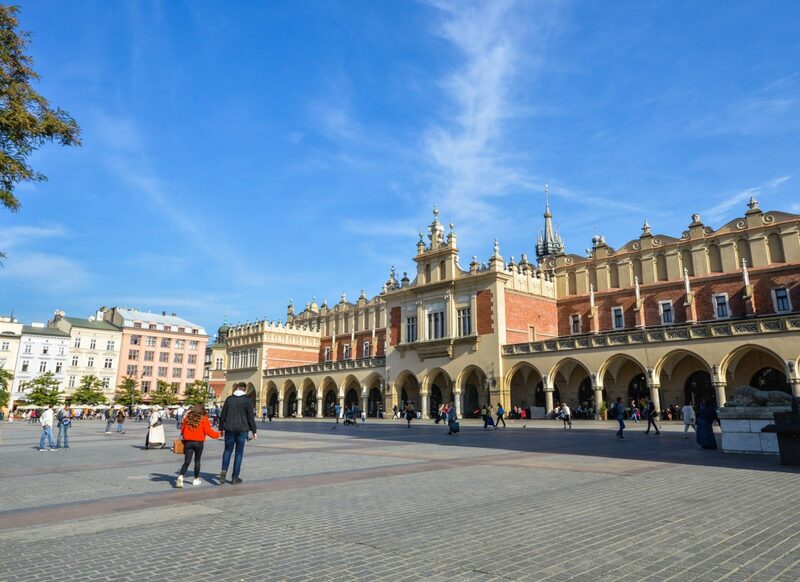 With its stunning architecture, delicious Polish cuisine, incredibly affordable prices, trendy Jewish Quarter, and bustling old town square you’ll never be left wondering what there is to see in Krakow. The list of Krakow attractions is long, so we have taken the liberty of shortening it a bit for you, and sharing some of the things we personally enjoyed experiencing during our three visits to this city. So if you’re a history buff, budget traveler, or lover of eastern European cuisine don’t hesitate. Check out our list of Krakow attractions you should partake in, and start planning a trip to Krakow today! Before we get to all the things you can do in Krakow, let’s start with some basics to get you guys off on the right foot. Before we delve into all the amazing things there are to do in Krakow, here is a bit of information about the city to get you orientated. Location – Krakow is located in southern Poland in Eastern Europe. It’s the second largest, and one of the oldest cities in Poland. The city has a population of about 760,000 inhabitants and a lively, yet chill, vibe. Language – The language spoken in Krakow is, of course, Polish but nearly every working in the service industry speaks English so you’ll have absolutely no issue with communication here. Plus people are incredibly friendly so you’ll feel right at home. Currency Used in Krakow – Despite being a part of the EU, Poland uses its own currency – Polish Zloty, which can be acquired from any ATM machine around town. We suggest avoiding Euronet ATM machines, however, and opting for bank machines to avoid unnecessary fees and unfavorable exchange rates. Weather in Krakow – Krakow has four seasons. The coldest month of the year is January and the warmest is July. The best time to visit as far as weather (and crowds) are concerned is during the Spring or Autumn months. Public Transportation in Krakow – Krakow has a decent public transport system that includes trams and buses that run frequently from 5:00 am – 11:00 pm and infrequently outside those hours. There are various discounts for tickets but the normal price of one ticket is 3.80 zloty per journey. For complete ticket pricing information click here. In addition to public transportation, Uber and Taxify also function in Krakow and are extremely affordable. 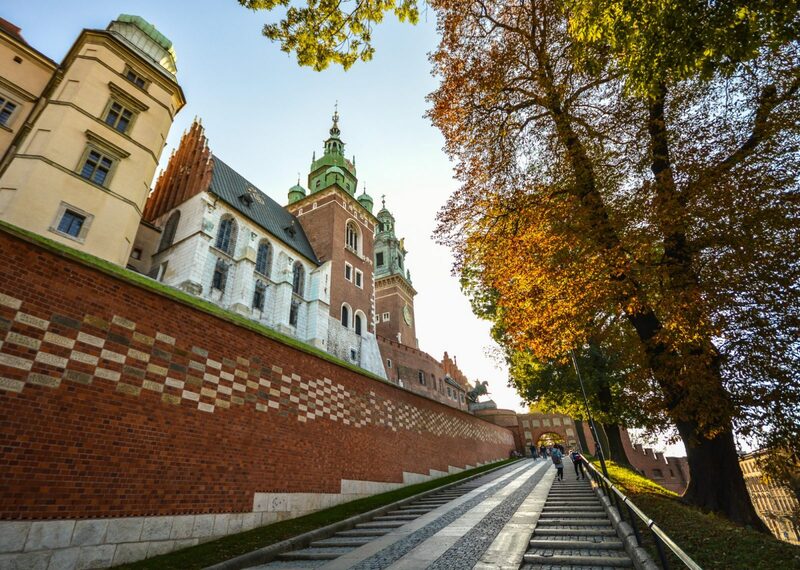 Getting to Krakow – Krakow can be reached by plane, train, and bus. The John Paul II Kraków-Balice International Airport is a mere seven miles from the city center and receives millions of travelers from all over Europe each year. Additionally, Krakow can easily be reached by train from Germany, Czech Republic, Austria, Hungary, and other destinations in Poland. Traveling by bus is also possible from many major destinations in Europe. 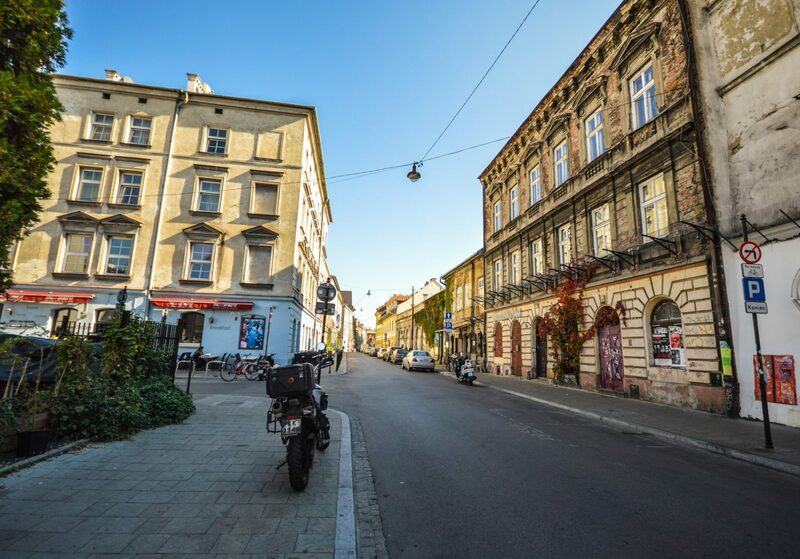 Getting from Krakow’s Airport to the City – Traveling from the airport to the city center is easy and relatively inexpensive. Public transportation by bus is an option but an uber will cost under €20.00 and take about 20 minutes. Alternatively private transfer can also be arranged in advance from the airport to Krakow’s city center for €20.oo euros. The Hotel Wentzl is well suited for travelers looking to enjoy a bit of luxury while visiting Krakow. The centrally located hotel is housed in a 15th century building located right on the Main Market Square in Kraków and offers luxurious individually decorated rooms with air conditioning, satellite TV, tea and coffee facilities, and a minibar. The hotel has an on-site restaurant and 24 hour staff. 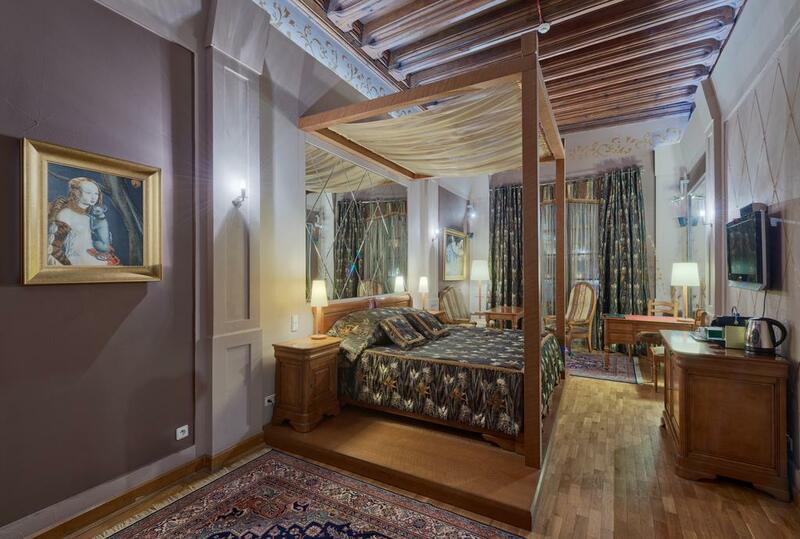 If you want to feel like royalty while in Krakow, this is the hotel for you! The highly rated Hotel Eden is located in the heart of the trendy Kazimierz neighborhood, Krakow’s old Jewish Quarter. This budget hotel includes everything you will need during your stay including free wifi, friendly staff, well appointed rooms, and even a sauna and salt grotto. If you’re looking for a centrally located hostel located in a historic setting, look no further than Cracow Hostel. This hostel is located in Market Square in a renovated fourteenth century house, and has everything a traveler could possibly need including power plugs by each dorm bed, private lockers, and a perfectly equipped kitchen. For budget travelers, Cracow Hostel is the best accommodation option in Krakow. For more options on where to stay in Krakow check out our guides to the best hotels and hostels in Krakow! 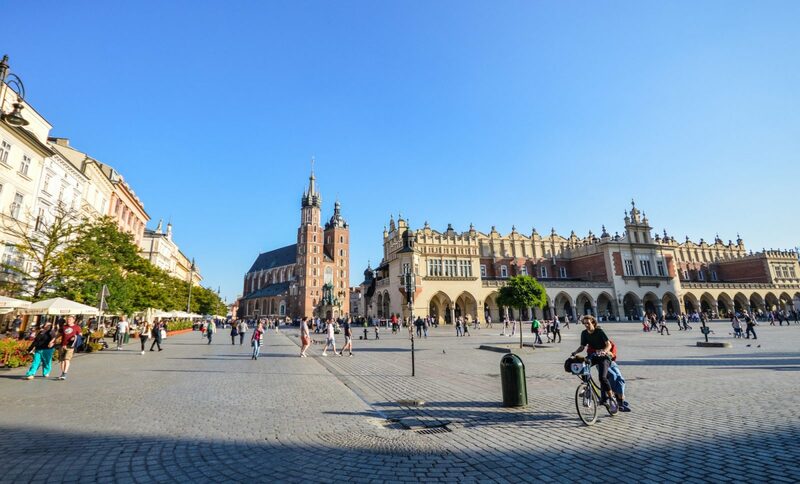 As with most cities in central and eastern Europe, the Main Square is absolutely the first thing any visitor should have on their list of things to do in Krakow. The square dates back to the 13th Century and is a whopping 40,000 square meters making it one of the largest medieval town squares in all of Europe. Given its size, and the fact that it’s a UNESCO World Heritage Site, it should come as no surprise that throngs of tourists flock to the square year-round. Don’t expect a peaceful crowd-free experience in one of Krakow’s top attractions. However, given the vastness of the square there is room for everyone to enjoy it. Just watch out for the annoying horse drawn carriages that have overtaken the exterior edges of the square. The square has several attractions, each of which vie for attention like a pretty charm waggling in front of your face, making it a bit difficult to know which direction to head in. We suggest making your way into the belly of the beast, aka Cloth Hall, first. This massive Renaissance style building occupies the center of the square and is impossible to miss. The main reason to visit Cloth Hall is to gawk at the gaudy collection of trinkets and trash contained within. Here you can find pretty much any of the cheap souvenirs that are displayed all across the most touristy locations in Europe. We can’t imagine this sounds appealing to most well-traveled visitors, but it’s worth a peek to see the sheer audacity of it all. Plus you’re sure to walk away feeling better about your life and happy to have survived this tourist trap intact. Once you’ve reached the safety of daylight again, feel free to admire the stunning and colorful historic townhouses that surround the square, but don’t be tempted to take a coffee or beer break at one of the overpriced cafes and restaurants laying at the feet of said townhouses. There are plenty of better places to spend your money in Krakow. Venture down pretty much any side street and you’ll find a cafe, bar, or restaurant that can quench your thirst. If you’re a savvy traveler and wonder where Town Hall is hidden, look no further. It was actually destroyed in 1820 never to be rebuilt. Not to worry though, the Town Hall Tower does still exist and the decapitated head of Eros can be found discarded at its doorstep. Once you’ve captured the typical photo with said empty headed man venture over to St. Mary’s Basilica to admire its beauty. Just watch out for the pigeons, they’re almost as abundant as the people in this square and will easily leave their mark on you if you’re not careful. A stunning Gothic beauty, the red brick St. Mary’s Basilica stands boldly in one corner of the city’s main square, as people and pigeons flock to the cobbled streets that splay out around it in every direction. The basilica towers proudly over the crowds below, as if triumphant over the demolition and destruction that once conquered it. Despite being totally destroyed in the 13th century the structure was rebuilt shortly afterwards. In the 15th century the towers, which it is best known for, were added to the basilica. A watchtower was added to the 80 meter high north tower giving the Basilica both physical and spiritual protection over the city of Krakow. As impressive as St. Mary’s exterior is, it doesn’t hold a candle to its interior. The ornately decorated wooden altarpiece, which took 12 years to complete, and the brightly colored stained glass windows are show stoppers. 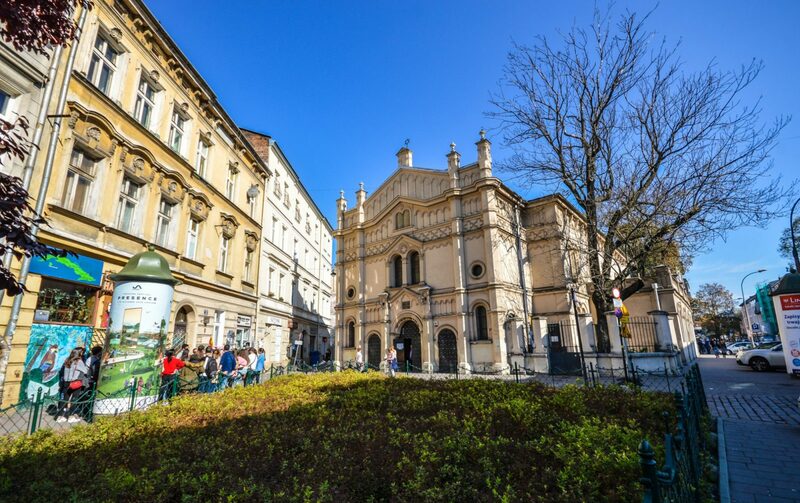 Which begs the question: how exactly exactly do believers manage to partake in mass or prayer without being distracted by its stunning beauty throughout the service Answer that question for yourself when you visit this beautiful Krakow attraction. The most unusual and unexpected treasure in Krakow’s main square is the work of art known as Eros Bendato or Eros Bound. The piece was created and gifted to the city by Polish artist Igor Mitoraj. Despite sticking out like a sore thumb the artwork is one of the most photographed Krakow attractions in the square, and is usually teeming with children crawling both inside and outside of it as proud parents snap shots. Ironically, this popular attraction was not originally meant to live below the Old Town Tower. However, after some controversy and opposition, which seems to have faded away, it found a happy home here. It looks freaking awesome, as you can see, so make sure you snap a few of your own Grams when you’re in Krakow! The UNESCO Wawel Castle in Krakow sits slightly elevated on the outer edge of Old Town atop a dragon’s lair, or so the legend goes. The impressively colorful, ivy adorned castle was the home to Polish royalty for over 400 years. Today is serves as both an iconic Krakow landmark and as a museum. The multi-domed and multi-spired Wawel Cathedral is the most eye-pleasing structure on the grounds. No surprise considering it is where Polish queens and kings were crowned, and is the final resting place of royalty and notable historic figures. A tour of the castle’s interior is a must. To say it is decorated ornately would be a gross understatement. Gaudy wallpaper, paired with ornately woven carpets and wall hangings, and gold adorned chairs, mirrors, and ceilings make for an overly lavish display of wealth and power leaving one to wonder – did Polish royalty have something to prove? Adjacent to the cathedral lies a peaceful garden and what is probably the best place to snap a few shots of the complex away from the crowds. It’s totally free to explore the castle grounds so we highly recommend making a visit. You can book one of many different tours of this top Krakow attractions using the link right below. We get a small commission if you do, which helps us keep this site up and running! 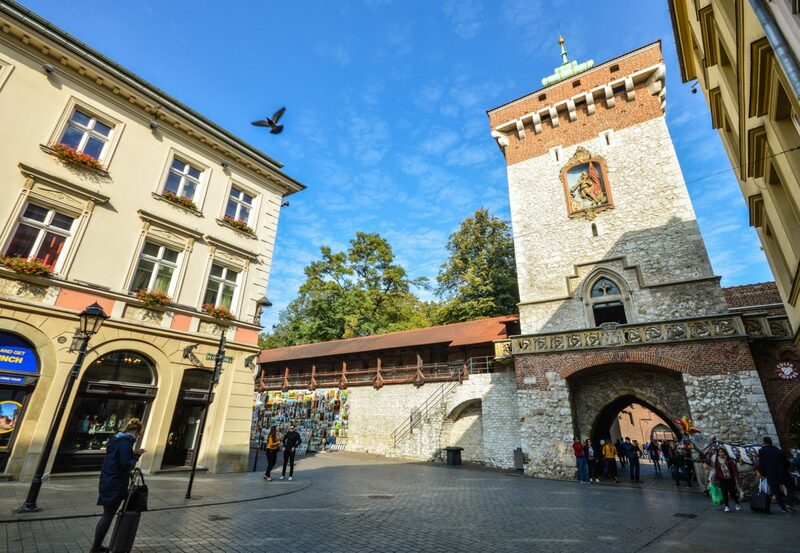 Once upon a time the city of Krakow was adorned with an impressive network of fortifications including a two mile long, 33 foot high, and 7 foot thick wall, 47 towers, and eight gates. 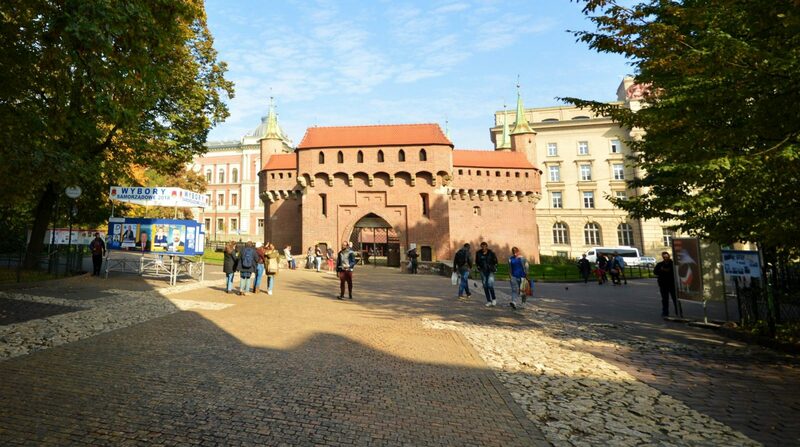 At the northern edge of Old Town you can see St. Florian’s Gate and the Barbican, the remains of this historic fortification. St Florian’s Gate is a Gothic tower and gate that dates back to the 14th century. As far as gates go, St. Florian’s is impressively decked out. The gate includes a small alter to Our Lady of Piasek, a first floor balcony, an arcade, and a chapel. Additionally, the north side of the tower is adorned with the figure of St. Florian, and the south side with a stone eagle signifying the Piast family, the first ruling dynasty of Poland. You will no top run across this Krakow attraction as you explore the Old Town. Just a stone’s throw north of St. Florian’s Gate lies The Krakow Barbican. This brick structure once served as a fortified gateway to the city and is now part of the Historical Museum of Krakow and home to a number of exhibitions throughout the year. Unless you’re a proper history buff you might be inclined to quickly overlook the importance or appeal of the Barbican. However, the structure, which was built in the late 15th century is one of only two other fortification outposts of its kind that exist in all of Europe. One of the most remarkable aspects of the historic structure is that it was designed based on Arabic defensive strategy, something quite surprising to find so far north. If you want to explore the interior of this moated structure, and you should because it’s it’s quite a bit larger than it appears from the outside and contains a treasure trove of design surprises, the entry fee is a paltry 8 zloty ($2.10 usd). If you only do one thing outside of old town it should be a visit to Kazimierz, the historic Jewish quarter in Krakow. This neighborhood contains some of the coolest cafes, bars, restaurants, and shops in the city. It’s also the perfect place to wander around for a few hours on a sunny day. Forget Google maps and follow your instincts by exploring whatever little street you feel so inclined to walk down on a whim. A definite highlight of this cool Krakow neighborhood is MARKA Concept Store which sells Polish made furniture and decor items. If you are hungry check out Youmiko Sushi restaurant which makes incredible handcrafted sushi (and the best vegan sushi we’ve ever had). After that visit the super cool HEVRE cocktail bar & restaurant which is a unique spot mixing up fantastic handcrafted cocktails, or Warsztat Herbaty teahouse with hundreds of teas available to enjoy on-site or at home. Of course, Kazimierz is also full of historic buildings, synagogues, and churches. Some notable ones include the Tempel Synagogue which was built in 1862 and is the newest in the city. Today the synagogue a place of worship and home to a number of events throughout the year. Also, the aptly named Old Synagogue is located here and is the oldest synagogue in Poland. It’s also currently the Museum of the History and Culture of Kraków Jews. Finally, Corpus Christi Basilica in Krakow is an impressive and unmissable a Gothic church that dates back to 1335. The church exists on a fairly large plot of land in this small neighborhood due to the fact that it was originally intended as as a monastery church. 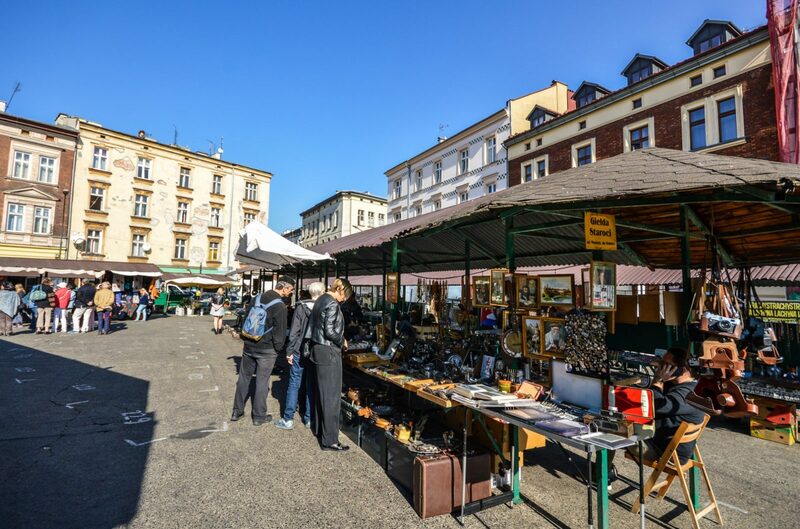 If you’re a fan of flea markets Plac Nowy is an absolute must. This flea market has been going strong since 1808 and is located at the site of a former slaughterhouse. On Saturday the market explodes with hundreds of merchants selling anything your deal-seeking heart desires including electronics, books, antique furniture, clothes, and furs…strangely lots of furs. If, like us, massive crowds and dust covered wares are not your cup of tea then opt to visit the space on a weekday when it’s much more chill. There are still vendors displaying some pretty cool handicrafts, trinkets, and antiques. Plus there are some nice food carts and stalls onsite where you can grab a causal lunch if you’re a bit peckish from all the haggling. The Bernatek Footbridge is just a short stroll from Kazimierz and connects the neighborhood with the historic Jewish Ghetto in Krakow. The 100 meter long pedestrian bridge was opened in 2010 and named for Laetus Bernatek, It is currently adorned with the stunning artwork Jerzy Kędziora depicting nine acrobats in various poses. 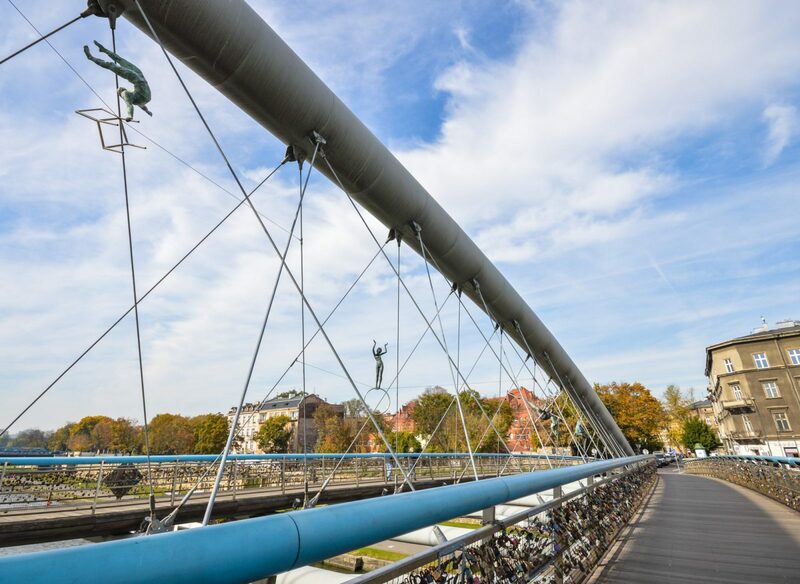 Like many bridges in Europe, the Bernatek Footbridge has become the target of hopeful romantics who have attached locks to it as a symbol of love. Since the weight of these locks in mass can be detrimental to the structural soundness of the bridge it’s likely they’ll eventually be cut off, dashing the intentions of those overly romantic souls. That being the case, we advise you to spend your time on the bridge admiring the river and city views instead of pointlessly vandalizing it. Plac Bohaterów Getta (Ghetto Heroes Square) in Krakow is host to one of the most curious art installations we’ve come across. 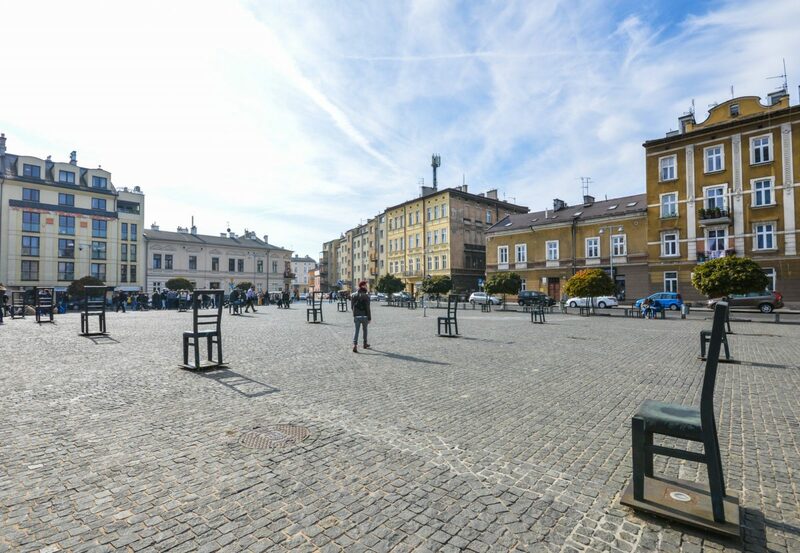 The collection of 33 oversized iron chairs are neatly arranged in rows throughout the massive square in the center of what was once Krakow’s Jewish ghetto. The chairs represent the furniture and personal effects of Jewish residents that were abandoned in the square when the Nazis occupied the city during WWII. They symbolize the expulsion of the families that lived in the neighborhood during this time and the tragic fate they met. Made famous worldwide by the 1993 film Schindler’s List, Oskar Schindler is personally responsible for saving the lives of 1,200 Jews by employing him in his factory during WWII. 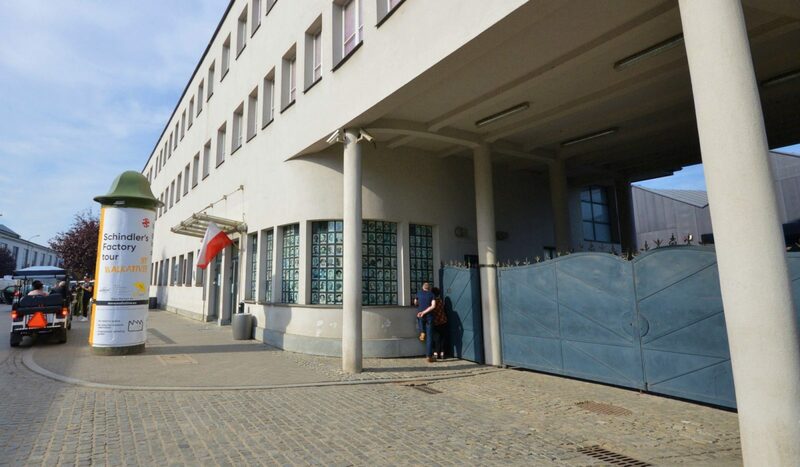 Today the factory has been transformed into a museum where visitors can explore 45 exhibition rooms dedicated to educating current generations about the life of residents in Nazi-occupied Kraków. Additionally the former office of Oskar Schindler was preserved throughout the years and is part of the permanent exhibition of the museum. A bit of advanced planning is recommended as the museum can get incredibly busy during peak hours. To avoid long waits we suggest purchasing tickets in advanced online or booking a guided tour. 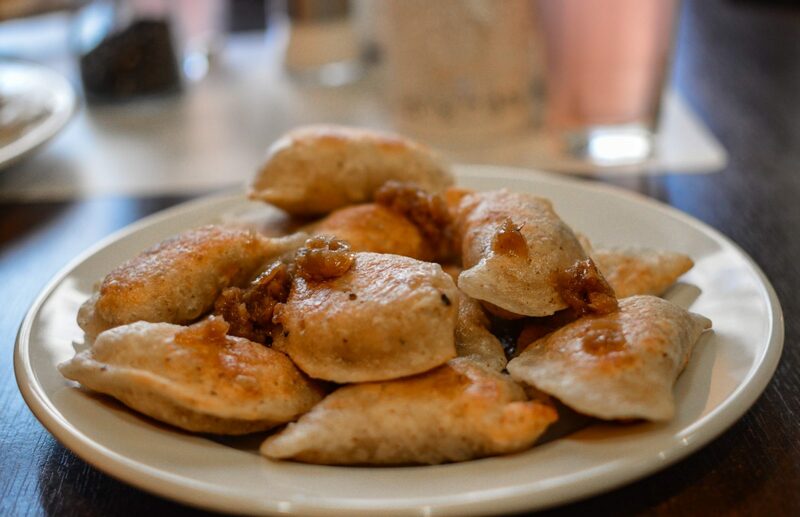 Polish pierogi are perfect, filled pockets of pleasure. That may very well be a hyperbolic alliteration but they are seriously delicious and an absolute must when visiting Krakow. Luckily Pierogi can be found all over the city. These delightful gems come either steamed or fried and with enticing fillings like sauerkraut, spinach, potato, meat, or cheese. There is even a sweet variety stuffed with fruits like cherry, strawberry, and blueberry. Whatever you do, make sure you get the savory ones topped with fried onion. You won’t regret it. Our favorite place for pierogi in Krakow is Pierogowy Raj, a tiny hole-in-the-wall kind of restaurant in Old Town offering vegan, vegetarian, and meaty pierogi. In our one week visit to Krakow we ate here three times. It’s that good! 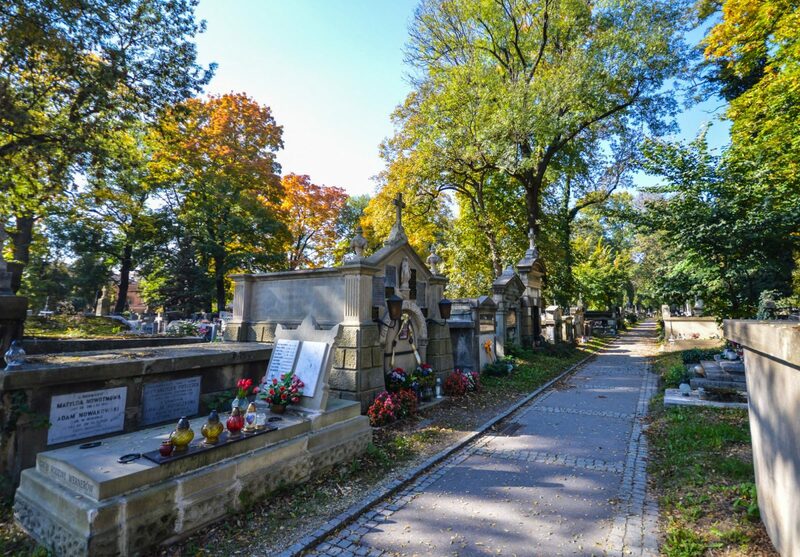 Rakowicki Cemetery is a pleasant 20 minute walk from Krakow’s Old Town and totally worth a visit if beautiful old cemeteries are your thing. The cemetery was first established in the early 1800s and has grown from its original 13 acres to over 100 acres. 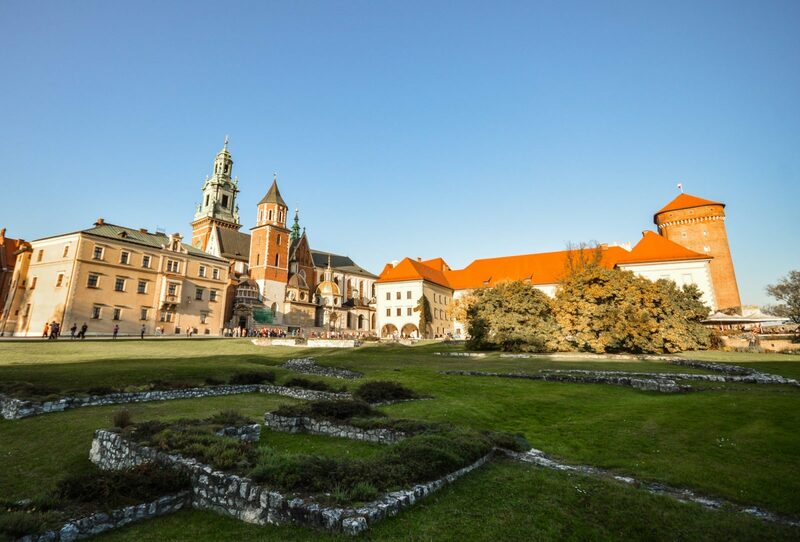 It’s a sprawling collection of compact plots of land containing the remains of thousands of former residents of Krakow, notable persons, and national heroes. Additionally, some of the gravestones, mausoleums, and sculptures in the cemetery can be attributed to well-known architects and artists. The Auschwitz Complex, which consists of 40 former concentration camps, is located about 43 miles west of the Krakow. 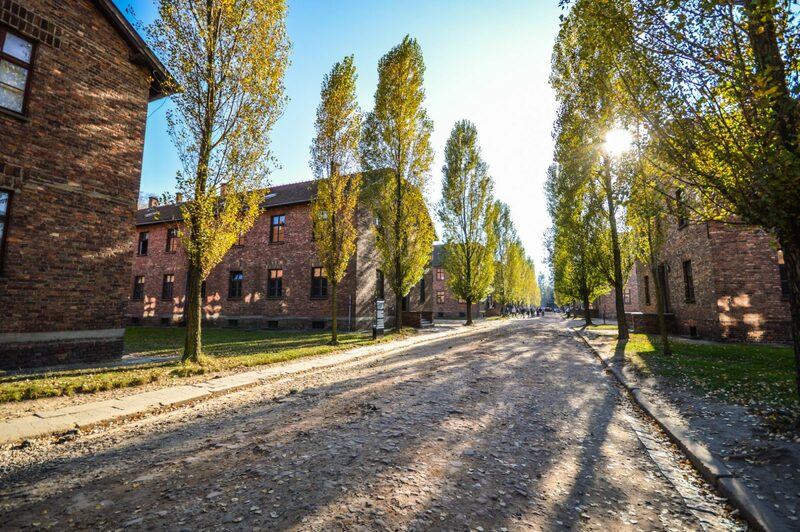 The most well-known camps, Auschwitz I and Birkenau can easily be visited on a day trip from Krakow. The Auschwitz and Birkenau concentration and extermination camps are where some of the most horrific events of the Holocaust, including the murders of over a million people, took place. Today the site has been converted into a memorial and museum where visitors can learn about the history of the two locations and the activities that took place here. Auschwitz I are composed of 22 preexisting multi-floor brick buildings where prisoners who were not immediately murdered upon arrival were housed. Exhibitions within multiple buildings tell the stories of those who ended up here. Personal items which were confiscated from prisoners are on display throughout the museum. Suitcases, cooking equipment, clothing, shoes, and even prosthetics of former prisoners can be seen. Likely the most horrifying is the display of tons of hair that was shorn from former prisoners. Despite the incredibly heinous history of Auschwitz and the fact that there are hundreds, if not thousands, of people visiting the memorial at any given time, the grounds are eerily peaceful. The red brick buildings, tree-lined streets, and vast sky above make for a somber, yet amicable atmosphere. A strange juxtaposition of the dreadful past and peaceful present, to be sure. Birkenau is about two miles from Auschwitz I. A former suburban town was transformed by Nazis into what was intended as a prison, but was ultimately the site where nearly 90% of all murders in the Auschwitz complex took place. Birkenau, with its railway tracks, was also the arrival and departure point for prisoners. 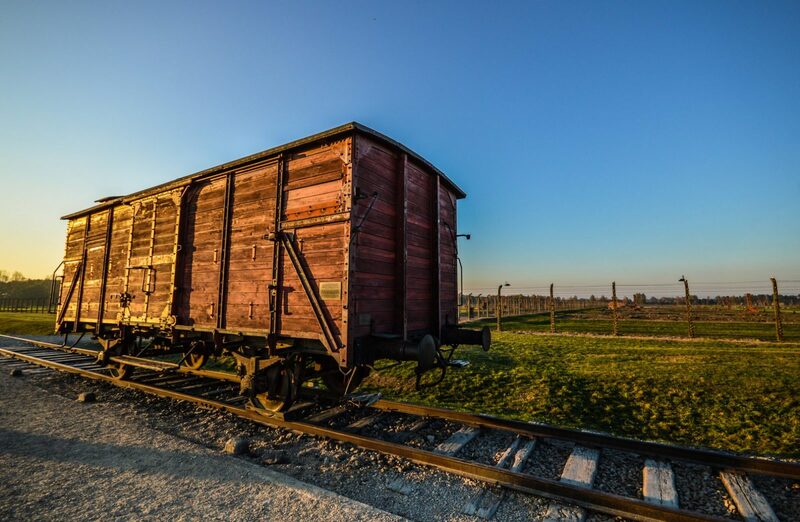 Today visitors can see an actual train-car which was used to transport hundreds of prisoners, as well as buildings which housed prisoners while they were unknowingly awaiting death. There is also a recreation of the crematoriums which were used to burn the bodies of those who were murdered here. Finally, there is also a monument onsite which was erected in 1967 to pay tribute to those who lost their lives here. There is no admission fee to visit Auschwitz Birkenau and you can book a space online in advance here. However, it’s advisable to have a guided tour during your visit. The grounds are sprawling and information about the history of the concentration camp is sparse. When we visited we had an incredibly knowledgable guide who shared an a great deal of information about the history of Auschwitz during the tour. If you do opt for a guided tour of Auschwitz from Krakow it will take about seven hours in total. Private transportation and a tour guide is included, and the tours usually include up to 30 attendees in total. Additionally, a totally private tour is also possible and advisable if you want to avoid being part of a big group and have control over how much time you spend at each location. Who wouldn’t want to spend the day 400 feet below ground surrounded by salt? Actually, upon first hearing about the Wieliczka Salt Mine our inclination was to not give it a second thought. 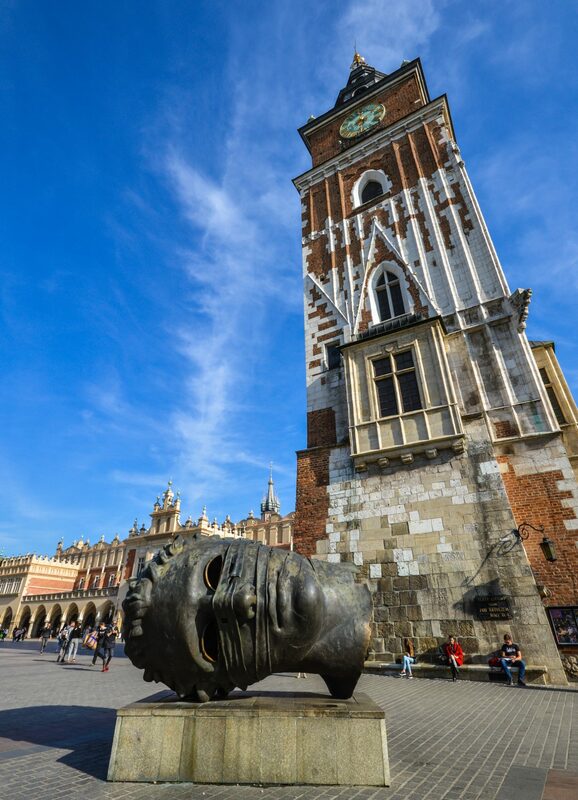 However, the UNESCO World Heritage site is actually one of the most popular attractions to visit on a day trip from Krakow, and with good reason. 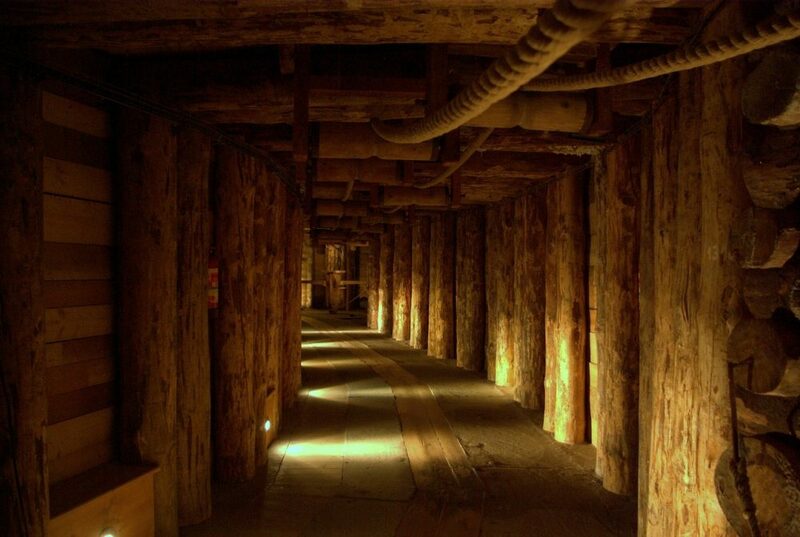 This historic salt mine includes hundreds of kilometers of tunnels to explore. Guided tours of the salt mine include the exploration of an underground city, salt lakes, chambers, and the lavish St. Kinga’s chapel which was built in 1986. The entire chapel is carved out of salt rock and contains salt chandeliers, statues, and carvings. If you’d like to visit the Wieliczka Salt Mine on a day trip from Krakow we suggest booking a small guided tour to get the most out of your visit. So there you have it guys, the top things to do in Krakow Poland. Hopefully you’ll be tucking into those puffy pillows, also known as Polish pierogi, soon and exploring this awesome city on a full stomach. As always, happy travels and we’ll see you on the road!